Centennial Golf Club Honored As One Of The Top 50 Public Courses In Country By GolfWorld! 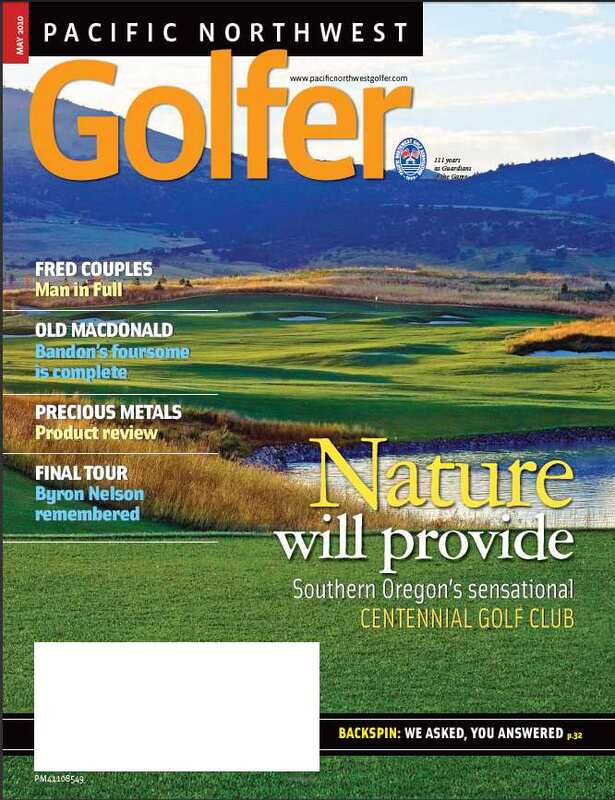 The John Fought-designed Centennial Golf Club in Medford, Oregon, was honored as one of the Top 50 Public Courses in the country by readers of Golf World® magazine. Centennial debuted at #6 in this ranking, which was published in the September 28, 2009 issue of Golf World magazine. The Golf World Readers’ Choice Awards recognizes the top public, resort, and private golf facilities throughout the country, with ratings based entirely on reader reviews and input. Readers graded the clubs using a ten-point scale and a variety of criteria, including the quality of course, conditioning, practice facilities, services, overall value, and speed of play, to name a few. More than 46,000 individual facility ratings and more than 600,000 criteria evaluations were collected by Golf World to determine the winners in each category. Centennial also made the top 10 “Best of the Best” list in course condition (voted #5) and in quality of course (voted #9). The only other Southern Oregon course which was included in any of the three rankings including Bandon Dunes which came in at #2 amongst the Top 50 Resort courses listing. Centennial Golf Club was named as the “Best Golf Course” in the 2008 Mail Tribune’s annual reader’s poll. One of the region’s longest running newspapers, the Medford Mail Tribune newspaper has been serving Medford, Ashland, Jacksonville and most of Southern Oregon for nearly 100 years. In their annual readers poll Centennial topped all other courses, ranking ahead of Eagle Point Golf Course and Rogue Valley Country Club. Centennial was also honored as having the “Toughest Golf Hole” in the region as the par 4, third hole took top honors in this category. The third hole is the #1 handicap hole at Centennial and stretches to 452 yards from the back “black” tees. The 233 yard, par 3, fourth hole was also included as a runner up in this category. Oregon Golf Association Determines Course Ratings For Centennial Golf Club - Sixth highest rating in the state of Oregon. The Oregon Golf Association is pleased to welcome the latest John Fought designed course to the roster of championship caliber Oregon courses and has calculated the USGA Course and Slope Ratings for Centennial Golf Club. Designed by 1977 U.S. Amateur Champion John Fought. Centennial is scheduled to officially open May 20. Fought has designed a number of other premiere golf courses in the region including Pumpkin Ridge, the Reserve and Langdon Farms. For Men, it will play 7,309 yards from the Black Tees with a USGA Course Rating of 75.0 and a USGA Slope Rating of 130. This ranks Centennial as the sixth most difficult course in Oregon. Centennial Golf Club, the region’s newest daily fee facility, recently announced their grand opening will take place on Saturday, May 20, 2006. Designed by two-time PGA Tour winner and 1977 U.S. Amateur Champion, John Fought, Centennial will boast an impressive 7,323 yard layout that plays to a par of 72. A native Oregonian, Fought is very experienced in the region having designed or co-designed such notable courses as Pumpkin Ridge (Ghost Creek and Witch Hollow), Crosswater and Meadows Course at Sunriver Resort, Langdon Farms Golf Club, and The Reserve Golf Club. Centennial Golf Club and OB Sports Golf Management are pleased to announce the appointment of Vince Domenzain as General Manager/Director of Golf for the new Centennial Golf Club in Medford, Oregon. Vince will direct all aspects of the facility operations including pre-opening activities, golf operations, food and beverage, agronomy, sales, marketing and instructional programming. In addition, Domenzain will be charged with the responsibility of establishing and implementing the OB Sports world class guest service standards at this new John Fought-designed facility. Centennial Golf Club in Medford opened in the spring of 2006, Centennial Golf Club features 18 holes designed by two-time PGA Tour winner and 1977 U.S. Amateur Champion, John Fought. Centennial Golf Club will be open to the public and will feature a 7,323 yard, par 72 layout, an expansive practice facility and distinctive clubhouse.